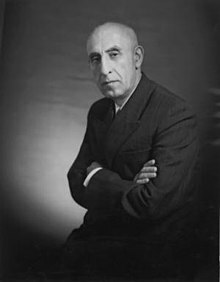 Mohammad Mosaddegh was an Iranian politician. He was elected Prime Minister of Iran from 1951 until 1953. He was also an author, administrator, lawyer, and parliamentarian. On 19 August 1953 Mosaddegh was removed from office by the American Central Intelligence Agency (CIA) and Britain's MI6. This was called Operation Ajax in the West. In Iran it is called the 28 Mordad 1332 coup. The change in power was one reason for the Iranian Revolution in 1979. Mosaddegh was named man of the year in 1951 by Time magazine. He remains one of the most popular people in Iranian history. ↑ "CIA finally admits it masterminded Iran's 1953 coup". 19 August 2013. Retrieved 8 September 2016. ↑ "49th Death Anniversary of Dr. Mohammad Mosaddegh". Iran Review. 2 March 2016. Retrieved 8 September 2016.